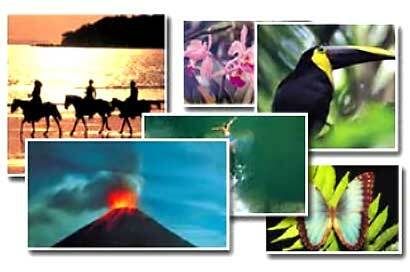 No matter where you are in Costa Rica there are always dozens of fun and interesting things to see and do. Take a canopy tour, go for a hike in a beautiful National Park, try white water rafting, or spend an evening at the casino and disco. You may want to spend a day at the hot springs and spa, ride horses on a remote beach, read a good book in your hammock overlooking the ocean, have a few Margaritas and watch a beautiful sunset, Costa Rica has it all. We have tried to include as many Other Adventures as we can, but the great thing about Costa Rica is that there is always a pleasant surprise and another adventure just around the corner. BIKING: Available everywhere, Mountain Bikes and Beach Cruisers are cheap transportation. BIRD WATCHING: Basically everywhere but specific tours are available for the serious Bird lover. BUNGEE JUMPING: Available at several places – lots of fun, a little scary. BUTTERFLY AND FLOWER TOUR: Available in a few places, a real treat for butterfly and flower people. CAMPING: Mainly primitive, get a cheap hotel instead. CANOPY TOURS: Available all over Costa Rica.Everyone loves the Canopy Tours. CASINO / NIGHTLIFE: Casinos and Nightlife are available in most of the popular towns. COASTAL BOAT CRUISE: Costa Rica type Love Boat a good way to see the coast line. CROCODILE TOUR: Day Tour available in several places. DIVING / SNORKELING: Available only in a few places, the best would be a trip to the Cocos Islands. DOLPHIN / WHALE WATCHING: Dolphins are usually everywhere plus we do see the occasional whale. HIKING: Available everywhere, The National Park tours are great. HORSEBACK RIDING: Available in most places, who hasn’t wanted to ride a horse on a beach. HOT AIR BALLOON: Over the Volcano’s or Jungle… something you will never forget. HOT SPRINGS / SPA: Available only in a few places, the best in romantic and relaxing getaways. JET SKI / WAVERUNNER: Available in the most popular towns, always fun. KAYAKING: Available in several places, white water or ocean kayaks – cheap water fun. LAKE FISHING: Fish for the Guapote (Central American Bass) at Lake Arenal and Lake Nicaragua, great fighters on light tackle. MOTORCYCLE / QUAD RENTAL: Available in several places, great fun, wear your helmet. MUSEUMS AND CHURCHES: Available mainly around San Jose Valley. NATIONAL PARKS: Available in most areas, great tours, see wildlife and beautiful scenery. OFFSHORE FISHING: World Class fishing for Marlin, Sailfish, Tuna, Dorado, Wahoo and more. PARAGLIDING: Available in a few places…try it if you get a chance…a few moments of panic followed by the best ride of your life. RIVER FISHING: Fly fish for Trout in the high mountain streams, fish the jungle rivers for giant Tarpon and Snook. SAILING: Available in a few places, peaceful and scenic. SHOPPING: Available everywhere, take home some souvenirs and coffee. SOCCER: If you get a chance go to a Soccer game in Costa Rica, they are wild and crazy but a great time even if you don’t know much about soccer. Give us a call or send us an e-mail if you have any questions about adventure vacations in the Jaco Beach area or if you need a “live” fishing report. Want your boat added? Contact Us. BIRD WATCHING:Basically everywhere but specific tours are available for the serious Bird lover. CANOPY TOURS: Available all over Costa Rica. Everyone loves the Canopy Tours. SURF / BOOGIE BOARD: Available in the most popular towns, what the hell…give it a shot. TURTLE WATCHING: Available only at certain times and certain places but for some the thrill of a lifetime. VOLCANO TOUR: Available almost everywhere, good family trip. WHITE WATER RAFTING: Scenic and serene beauty followed by wet and wild adrenalin rush.